A recent study shows the use of B3 aids in the prevention of miscarriages and birth defects. Does this mean all expectant mothers should stock up on B3? 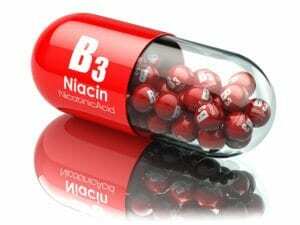 Vitamin B3 is another name for niacin. Niacin is a vitamin known to be effective at raising HDL cholesterol levels (the good cholesterol) as well as lowering triglycerides. However, this is only true when B3 is taken in high doses. However, higher doses of B3 can lead to side effects such as liver damage, glucose intolerance and gastrointestinal problems. If you and your doctor are wary of such a high dose, you can still take an over-the-counter B3 supplement that will reduce the risk of artery hardening and help decrease the risk heart attack sufferers from having a second heart attack. Because some doctors and patients have found that the benefits of the higher dose outweigh the risks, pharmacies have begun offering prescription only doses of the supplement. This allows doctors to control exactly how large of a dose their patients receive on a daily basis based on their specific health requirements. To understand how B3 will positively impact pregnancy, it’s important to understand what can harm it. NAD (Nicotinamide Adenine Dinucleotide) is a compound that is found in every cell of the human body and is used to turn fatty acids and glucose into energy. Most people can aid the development of NAD through a healthy diet that contains nuts, cheese, eggs and salmon or by simply taking a B3 supplement. Sometimes, when a pregnancy results in miscarriage or birth defects that affect the heart, kidneys and spine, the cause is related to a deficiency of NAD. In a recent study, researchers were able to show a total positive response between pregnant mice that were NAD deficient and taking B3. Will B3 Work for Humans? While it’s not yet clear that human will have the same response as the mice in the study did, it’s safe to say that researchers are highly optimistic. To be able to create a complete prevention of miscarriages and defects in the mice, researchers believe it’s just a short leap to being able to do the same for humans. In the US alone, up to one-third of pregnant women have low levels of NAD and low levels of B3. Given that the recommended daily amount for an expectant mother is 18 milligrams per day, it’s a simple fix that would help so many families. Testing for NAD deficiency isn’t as easy though. Researchers are trying to devise a test that can be easily and quickly run at the same time as a pregnancy test. This would allow doctors and mothers alike to become immediately aware of the deficiency and begin treatment as soon as possible. What Advice Should Expectant Mothers Heed? Every mother wants to do everything she can to prevent birth defects and possible miscarriage. The best first step is to talk to their doctor and find out what they need to do to be tested for NAD deficiency. Not every woman will be found to be in need of additional B3 and by taking an additional and unneeded supplement, more harm than good could be done. It’s also important to let a doctor evaluate how much of the supplement should be taken on a daily basis. The dosage will be determined by the NAD levels, the height and weight of the mother, and all other health conditions will need to be taken into account as well. Niacin is known to have adverse reactions when taken with some other supplements and medications. Because of these interactions, it’s imperative that the doctor is aware of all vitamins and prescriptions being taken, thus sticking to a simple prenatal vitamin with proper amounts of each essential nutrient needed during pregnancy is the best option unless a doctor advises differently. With a little more research, doctors could be well on their way to preventing certain types of defects and even saving thousands of young lives.